This 2-year project stems from analysis of data related to the ARBOVEC project implemented in Laos from April 2014 to August 2015. Insecticide resistance levels in 10 Ae. aegypti populations from 5 provinces were measured following WHO protocols. Several larval populations showed moderate resistance to the organophosphate insecticide temephos and high resistance to the pyrethroid deltamethrin. Bioassays performed on adult mosquitoes confirmed the presence of pyrethroid and organophosphate resistance with some populations being resistant to permethrin and malathion but also pointed out high resistance to the organochlorine DDT. In 2013, Lao PDR has faced one its most severe dengue outbreak in decades (>50,000 cases and 100 death; WHO 2013). The most recent outbreak was in 2017 with 11,000 cases reported, with a predominance of mostly DENV serotype 4. The mosquitoes Ae. aegypti and Ae. albopictus are the main dengue virus vector in Laos. Because there is still no vaccine or specific treatment available against this virus, vector control remains the only strategy for reducing dengue transmission Effective vector control measures rely on active community participation, health education programs, and environmental management (Erlanger et al., 2008). During inter-epidemic periods or when the elimination of breeding habitats of the mosquito is not easily achievable, insecticide application in larval habitats is routinely conducted by public health services in many countries including Laos (Rawlins 1998, Rodriguez et al., 2002). Space spraying applications are conducted during epidemics or when the entomological indices of mosquitoes are high. For both larviciding and adulticiding, organophosphates and pyrethroids are the insecticide families of choice against dengue vectors worldwide and in Laos. including cytochrome P450 monooxygenases (P450s), glutathione S-transferases (GSTs) and carboxy/cholinesterases (CCEs). A recent study performed by Faucon et al. (2015; http://genome.cshlp.org/content/25/9/1347) used a cutting-edge next generation sequencing approach for identifying novel molecular markers of metabolic resistance in Ae. aegypti. 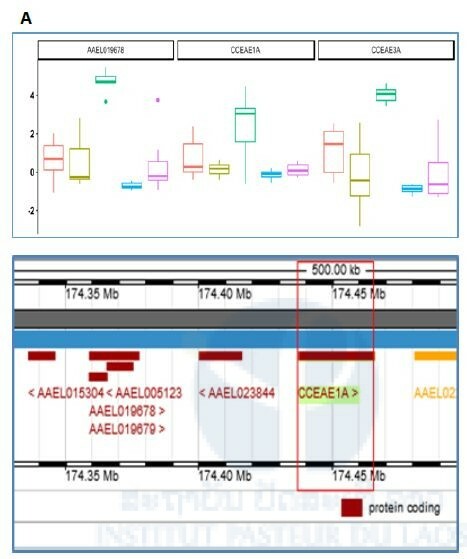 This study identified several gene Copy Number Variations (CNVs), Single Nucleotide Polymorphisms (SNPs) and differentially expressed genes (DE genes) strongly associated with resistance in populations from south-east Asia and showed that these novel resistance markers will well complement current target-site markers (kdr mutations) for monitoring the different resistance mechanism in natural populations and improving vector control strategies. Indeed, during the 2013 dengue outbreak in Lao PDR, more than $300,000 of temephos (Abate® formulation) were bought by the government without knowing the insecticide resistance status of Aedes sp. populations. 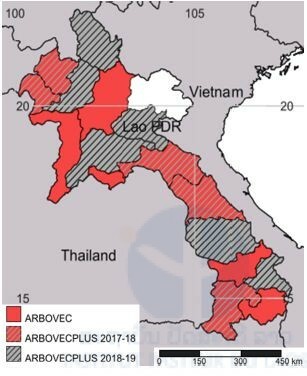 Until the recent ARBOVEC project (NMRHC-A funding, 1 year project at IPL, April 2014-August 2015) and compared to its neighboring countries there was barely no information available on the resistance status of dengue vectors populations in Laos. We now know that resistance levels to organophosphate and pyrethroid insecticides are high in several provinces and that metabolic based resistance and kdr mutation are likely involved (Dr. Marcombe, ARBOVEC project) and investigations on the specific metabolic mechanisms involved in the resistance at the gene level are now needed. 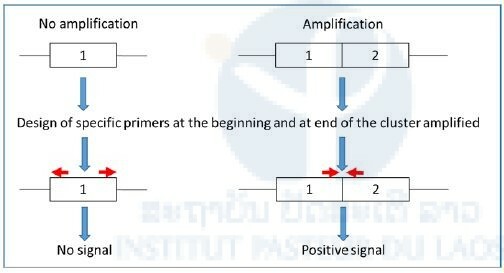 In this frame, the screening and validation of novel resistance markers will be implemented in resistant vector populations of several regions of Lao PDR representing various environmental characteristics which could influence the development of particular mechanisms. Covering a large part of Laos will allow us to develop tools able to detect a large variety of resistance markers in various settings. 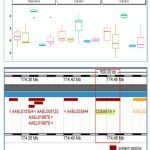 The validation and implementation of novel resistance markers will reduce the cost and the charge of the resistance monitoring compared to the usual techniques and will allow monitoring the spatial and temporal dynamic of resistant alleles/genes in the field in order to manage resistance locally. 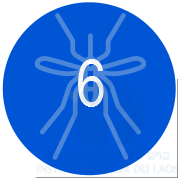 + Determine the resistance levels of Aedes aegypti mosquitoes from six provinces of Laos against conventional insecticides. + Validate the usefulness of novel molecular markers of insecticide resistance, recently identified in Ae. aegypti, in Laos. + Validate high-throughput PCR-based diagnostic tests to identify insecticide resistance in Ae. aegypti. Mosquito collections were implemented in Khammouane, Bokeo, Luang Namtha, Champasak, Borlikhamxay, and Xayaboury provinces in 2017 (Figure1). For the 2018 mosquito collection, it was decided to collect in Vientiane province (Vang-Vieng City), Phongsaly, Oudomxay, Xiengkhouang, Savannakhet and, Xekong provinces. Figure 1. 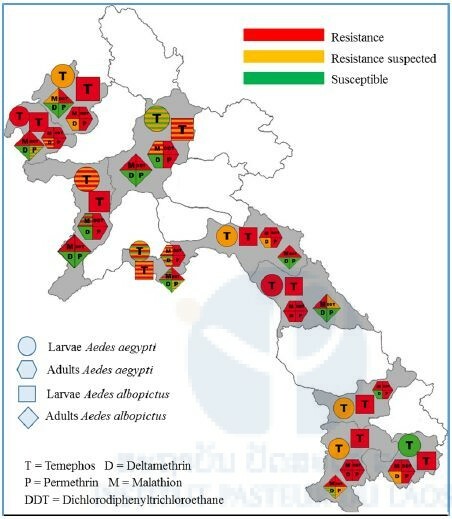 Map showing selected provinces for insecticide resistance monitoring in Laos. For all the mosquito populations collected, larvae were reared until adults (F1 generation; Figure 1). After adult identification, mosquitoes obtained were separated by species and location. Only Aedes aegypti and Ae. albopictus were kept for breeding. Females mosquitoes were then blood fed using quail and the eggs obtained were kept for the larval and adult bioassays. We tested the susceptibility of Aedes aegypti mosquitoes to a range of insecticides representative of those historically and currently used for mosquito control in Lao PDR (ie DDT, temephos, malathion, deltamethrin and permethrin). Larval and adult bioassays were be performed following WHO guidelines (WHO 2005 , 2006). Larval bioassays on Ae. aegypti were performed using late third- and early fourth-instar larvae of the field strains. For each bioassay, larvae of each strain were transferred to cups containing 99 mL of distilled water and 1 mL of the insecticide tested at the desired concentration. Larval bioassays on the Ae. aegypti and Ae. albopictus populations were run with diagnostic doses (WHO recommended) of deltamethrin (0.00132 mg/L), permethrin (0.014 mg/L), temephos (0.02 mg/L) and DDT (0.04 mg/L). Mortality was recorded after 24h. Following WHO criteria, a population is considered resistant if the mortality after 24 h is under 90%, resistance is suspected with mortality between 90 and 98% and a population is susceptible with mortality over 98%. Adult bioassays were run using filter papers treated with diagnostic doses of deltamethrin (0.05%), permethrin (0.25% ), DDT (4%), and malathion (0.8%) on Ae. aegypti and Ae. albopictus populations. Mortality resulting from tarsal contact with treated filter papers was measured using WHO test kits on adult mosquitoes of the different populations. Four batches of 25 non-blood-fed females (2–5 days of age) were introduced into holding tubes and maintained for 60 minutes at 27 ± 2°C and a relative humidity of 80 ± 10%. Insects were then transferred into the exposure tubes and placed vertically for 60 minutes under subdued light. Mortality was recorded 24 hours after exposure. To validate the usefulness of novel resistance markers (CNVs, SNPs and DE genes) identified in Faucon et al (2015) a composite population being representative of Lao PDR was built by pooling F1 eggs obtained from previously colonized resistant populations (10 Ae. aegypti populations from the ARBOVEC project). This composite population (named Metalao) was sent to the LECA-CNRS laboratory and was colonized for future resistance mechanisms studies. A composite population of Ae. albopictus from 5 provinces was built at IPL for further insecticide resistance and molecular analysis. This composite population (named MetalaoAlbo) was sent to the LECA-CNRS laboratory (February 2018) and is being characterized for insecticide resistance phenotypes and mechanisms. The Aedes aegypti composite population was established from various populations collected in Laos by the Institute Pasteur du Laos. Two generations (G1 and G2, without selection) were done in the laboratory to allow the mosquitoes to acclimatize to the conditions of the insectarium. Four generations of selection were done (from G3 to G6) with three different insecticides: deltamethrin and permethrin (pyrethroid family), and malathion (organophosphate), to segregate the resistant alleles. For every generations, 32 lots of 30 mosquitoes were exposed to lethal doses of these insecticides (60 to 80 % mortality maximum of the individuals). The first lineage (not selected) was raised in parallel without selection pressure. Four pools of 15 females were exposed to insecticides from G2 to estimate mortality rates (48 hours after exposure) during the selection. Ten pools of 5 females and 30 individual females were sampled before the selections (G2-NS for not-selected) and among the survivors of the 4th generation of selection (G6-deltamethrin, G6-permethrin, G6-malathion). Females of the first lineage maintained without selection in G6 (G6-NS) were sampled for the study. Besides, mosquitoes from the reference insecticide susecptible strain (Bora) were used as reference compared to the composite population. DNA extraction was performed using the CTAB method (cetyltrimethylammonium bromure). Mosquitoes were crushed in 250 µL CTAB 2%, then heated up to 65°C during 10 minutes before adding 250 µL of chloroform. After 5 minutes of centrifugation at 12000 RPM, 200 µL of the superior aqueous form containing the DNA were sampled and mixed with isopropanol. After centrifugation, isopropanol was removed and 200 µL of ethanol 70% was added. Ultrapure water was then added to the DNA (60 µL for pools and 30 µL for single specimen. DNA was dosed with a fluorimeter (Qubit®) and dilutions were done to obtain the same DNA quantity for each samples (0,1 ng/µL). The qPCR method used was described by Saavedra-Rodriguez et al. (2007). The mosquito genotype was determined by using meltcurves temperatures (resistant homozygote RR at 85,5°C, or homozygote sensible SS at 81°C for 1534 / 78,5°C for 1016), and 2 pics for these two temperatures for heterozygote RS. Faucon et al. (2015) showed that several gene cluster duplications were present in Ae. aegypti genome. 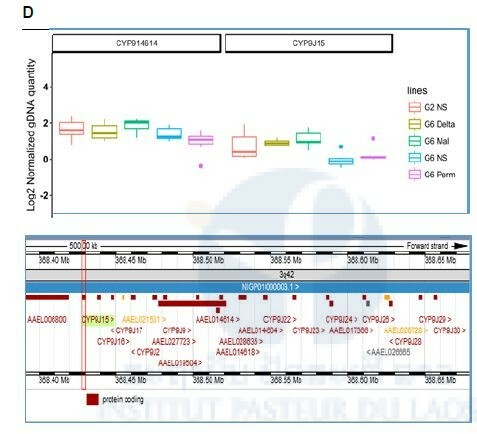 The following genes, belonging to different clusters, were chosen for the detection of CNVs: CYP9J28, CYP6Z-like, CYP6Z8, CYP6BB2, GSTE2 and, CCEAE3A. Detection of the CNVs was done by qPCR with specific primers. The gene copy numbers was made with the ΔΔCt relative method: the quantification of each interest genes was normalized by using the quantification of domestic genes identified in the genome by Faucon et al. (2015). These data were then normalized with the average of the CNVs obtained in the reference strain (Bora) to obtain DNA relative quantity between susceptible and resistant mosquito pools. The results of the adult and larval bioassays are presented in Figure 2. Larval Aedes aegypti and Ae. albopictus mosquito populations from Xayaboury, Bokeo, Luang Namtha, Borlikhamxay, Khammouane and, Champasak provinces were tested. All larval Ae. aegypti populations tested were moderately resistant to temephos. Most of the Ae. albopictus were resistant to temephos. All the adult populations tested were highly resistant to the organochlorine DDT. All the Ae. aegypti populations tested against permethrin (pyrethroid family) presented high levels of resistance. Most of the Ae. aegypti mosquito populations were resistant or suspected resistant to deltamethrin, which is also an insecticide from the pyrethroid family. Only three populations, from Xayaboury, Vientiane Capital and Luang Prabang provinces showed full susceptibility to this insecticide (100% mortality). All the populations tested against malathion, an insecticide from the organophosphate family, were resistant to this insecticide (mortality<90%). Only one population, from Xayaboury province showed full susceptibility to this insecticide (100% mortality). A composite population of Ae. aegypti from 10 provinces was built at IPL for insecticide resistance and molecular analysis. This composite population (named MetaLao) was sent to the LECA laboratory and was characterized for insecticide resistance. The composite population was resistant to temephos to deltamethrin and DDT and resistance was suspected to permethrin (Table 1). Table 1. Resistance status of Aedes aegypti composite population (MetaLao) on larvae to temephos, deltamethrin, permethrin and, DDT. Table 2. Resistance status of Aedes aegypti composite population (MetaLao) on adults to deltamethrin, permethrin, malathion and, DDT. Diagnostic doses of deltamethrin (0.05%), permethrin (0.25%), DDT (4%), and malathion (0.8%) were used. At LECA laboratory, further to the reception of the Ae. aegypti metapopulation from Laos, a generation without insecticide selection was made to obtain sufficient number of adult for the future selections. In parallel, preliminary tests were realized on the same generation to define times of exposures for each of the insecticides tested here: deltamethrin (0.05 %), malathion (5 %) and permethrin (0.75 %). The objective was to define a time of exposure corresponding to a lethal dose between 60 and 80min for females only. Up to now, six generations of selection were realized (F2 to F6). The objective was to realize at least 4 generations of selection. For each generation, 32 pools of 30 mosquitoes (male and female) were exposed to 20 min for deltamethrin, 10 min for malathion and 25 min for permethrin. For each of the selections, the mortality rates were measured independently of the selection by doing 4 pools of 20 individuals (female only). For every generation of selection, the mortality rates were measured for all the insecticides. For F2, the percentages of dead mosquitoes were calculated according to the insecticides to which they were exposed: 90 % for malathion, 85 % for permethrin and 70 % for deltamethrin. 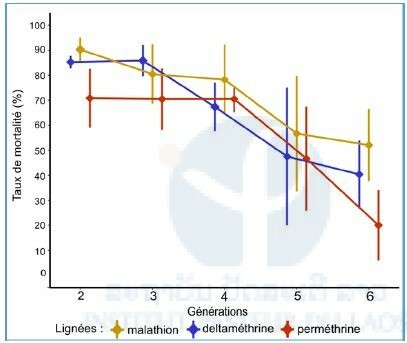 A significant reduction in the mortality, showing an effect of the selection, was observed for all the lineages from G5 (P<0,05). For G6, the mortality rates were 52 % for malathion, 40 % for deltamethrin and 20 % for the permethrin. Figure 3: Mortality rates of mosquitoes to the different insecticide over the generations (Fisher test: P<0,05 * compared with G2). We previously showed that selecting a composite Aedes aegypti population from Lao PDR with different insecticides (deltamethrin, permethrin and malathion) lead to a significant increase of resistance to each insecticide in only 4 generations, suggesting that resistance alleles to these insecticides are circulating in Lao PDR. To assess the specificity of the resistance phenotypes observed in each selected-line, we then performed comparative bioassays on each selected line with all insecticides. Bioassays consisted in exposing adults females from each line (not selected, deltamethrin-selected, permethrin-selected, malathion-selected) to a diagnostic dose of each insecticide and recording mortality rate 24h later. 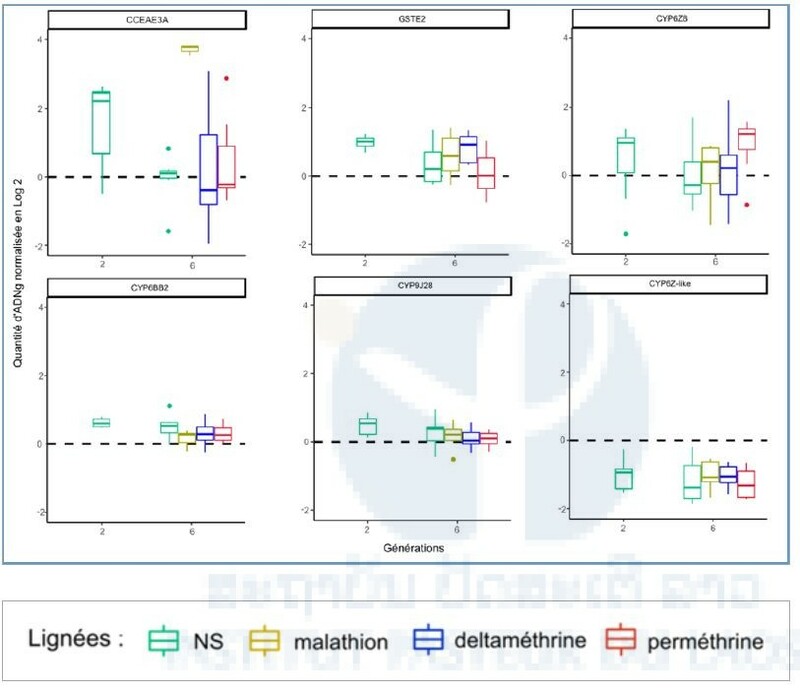 These comparative bioassays revealed that the resistance observed for both deltamethrin-selected and malathion-selected lines are highly specific while permethrin-selected line also displays some cross-resistance with other lines (Figure 4). Figure 4. Cross resistance test. A GLMer (binomial family) was performed to analyze these data. Each selected-line is identified by a different color. Different letters indicate significant mortality differences between lines for each insecticide tested. The evolution of the resistant allelic frequencies of the two kdr mutations was measured. In G2, the 1016 resistant mutation allele frequency was 0.13 % (Figure 5). The frequency increased significantly (0.4%) in G6 when mosquitoes were selected with deltamethrin (P<0.001) and permethrin (P<0.01). In the same time, the frequency of the resistant allele slightly increased for the lineage selected with malathion, and decreased significantly for the non-selected lineage (P<0.05). For G2, the resistance allelic frequency for the codon 1534 was 0,6. This frequency then remain stable: no significant difference with the composite population of departure was measured. 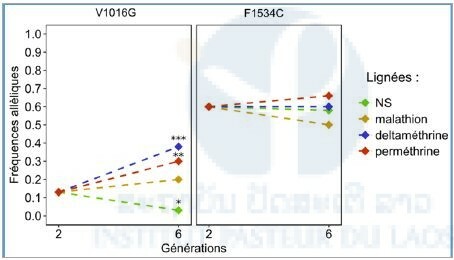 Figure 5: Allelic frequency of kdr mutations (V1016G and F1534C) for the different lineages (Fisher test: P<0.001 ***; P<0.01 **; P<0.05 *). NS: Not Selected. These results were also studied in the haplotypes form (Figure 6). A disappearance of the susceptible homozygotes (SS / SS) was observed in G6 with deltamethrin exposure and with permethrin. In the same time, a strong increase of the number of resistant allele individuals for every mutation (RS / RS) was measured: 29 % compared with G2-NS for permethrin, and 38 % for deltamethrin. Figure 6: Cumulated frequencies of kdr mutations haplotypes (F1534C and V1016G). 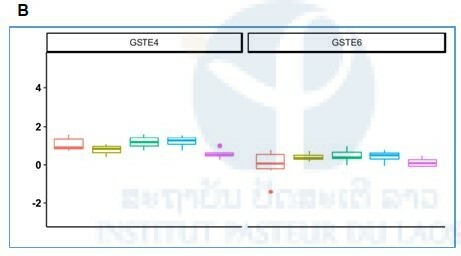 To know if the Lao composite population have already showed genomic increases for the chosen markers, the quantity of DNAg was compared between G2-NS and the susceptible Bora strain. 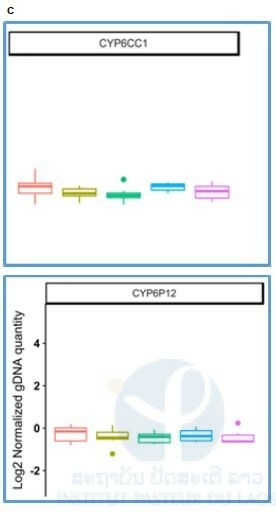 It was significantly superior in G2-NS for the genes CCEAE3A (P<0.05 ), CYP6BB2 (P<0.01), and GSTE2 ( P<0.01), which showed the presence of duplications (Figure 7). The quantities of DNAg of G6 of each of the lineages were then compared with those of G2-NS. A single difference was significant, the G6-malathion for the gene CCEAE3A, in which the quantity of DNAg four times superior to that measured in the G1 population (P<0.01). 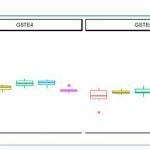 No other significant increase was noted after selection, even by including the genes where there was no effect in G2-NS. Figure 7: DNAg relative quantity variation for each gene. The black line represent the average CNV for the susceptible Bora strain. 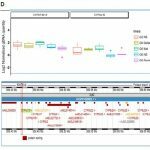 Previous attempts to identify CNV associated with resistance in each selected line by qPCR was pushed further in order to confirm prior results and to enlarge the panel of markers by targeting other potential genes of interest. 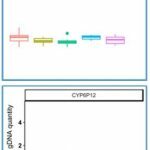 These experiments allowed to confirm the strong association between the genomic amplification of the carboxylesterase CCEAE3A and malathion resistance. By designing novel primers to target other neighboring esterase genes we showed that the esterase AAEL019678 is also specifically amplified in the malathion line (Fig 8A). A potential CNV signal was also detected for the esterase CCEAE1A (also in the same cluster) but with a strong polymorphism, suggesting that the amplification of this esterase cluster is probably not extending to this gene in most individuals of the malathion-selected line (Fig 8A). We also targeted two glutathione-S transferase genes, GSTE4 and GSTE6 but no signal of CNV were identified for any selected-line (Fig 8B). Finally, in attempt to identify CNV markers of pyrethroid resistance in Lao PDR, we targeted additional P450 genes (CYP genes) belonging to two CYP6 and CYP9 clusters previously associated with resistance in other geographic regions. 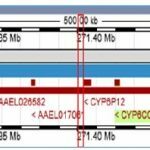 This included the genes CYP6CC1 and CYP6P12 in the CYP6 cluster (Fig8C) and genes AAEL014614 and CYP9J15 in the CYP9 cluster of CYP9J (Fig 8D). 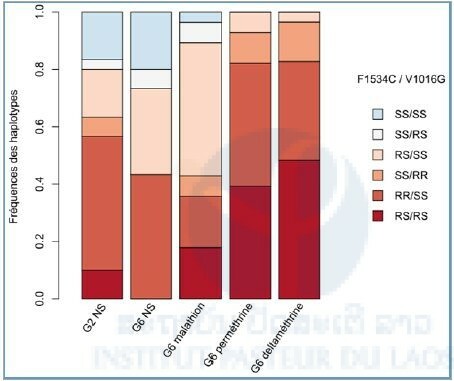 However, qPCR data confirmed the absence of CNV affecting these genes in any selected-line, suggesting that Kdr mutations C remain the best DNA markers of pyrethroid resistance in Lao PDR. Figure 8. Normalized gDNA quantity for each gene between each line. G2 NS: Lao composite population before insecticide selection; G6 NS: Lao composite population not selected with any insecticide for 5 generation, G6 delta/Mal/Perm: Selected-lines originating from G2 NS but having selected with a given insecticide (deltamethrin, malathion and permethrin respectively) for 4 generations. During the reporting period, a composite population of Ae. albopictus from 5 provinces was built at IPL for further insecticide resistance and molecular analysis. This composite (named MetaLaoAlbo) was sent to the LECA laboratory and was characterized for insecticide resistance. The larval composite population was resistant to temephos, deltamethrin and DDT (Table 3). The Adult composite population presented full susceptibility to deltamethrin and permethrin but was highly resistant to DDT (Table 4). Table 3. Resistance status of Aedes albopictus composite population (MetaLaoAlbo) on larvae to temephos, deltamethrin, per methrin and, DDT. Table 4. Resistance status of Aedes albopictus composite population (MetaLaoAlbo) on adults to deltamethrin, permethrin, malathion and, DDT. Besides the identification of novel DNA markers of resistance, the project also aimed at developing new resistance diagnostic tools to track insecticide resistance in the field. In this frame, we are currently trying to develop a PCR-based assay allowing to genotype the “presence/absence” of the esterase amplification mentioned above in individual mosquitoes. If our primer design strategy is successful, such PCR assay should be positive in presence of the genomic amplification and negative in absence of amplification (see figure 8). Currently, we are analyzing genome sequencing data previously obtained from an Ae. aegypti population from Thailand also carrying this esterase gene amplification at high frequency in order to identify the best primer design for this PCR assay. More precisely, we are using both read coverage and reads status to precisely identify the breakpoints (boundaries) of this large genomic amplification. Based on these NGS data, a first set of PCR primers have been ordered and will be tested on mosquitoes from Lao and Thailand in October-November 2018. If our PCR assay is validated, we will then use it to genotype the presence of this esterase gene amplification in individual mosquitoes from various field populations previously collected by IPL in Lao PDR. Laboratoire d’Ecologie Alpine, LECA,UMR UGA-USMB-CNRS 5553, Université Grenoble Alpes. Financial support This work is supported by the NMRC-Asia. ECOnomic Development, ECOsystem Modifications, and Emerging Infectious Diseases Risk Evaluation. Entomology work package (ECOMORE II).